After a well received first EP “HUA!”, Brazzmatazz now releases its debut album. “Turbolence” grew into a twelve-sided brassband beast that gnarls, barks and bites, but manages to build tensions back up at the right time. 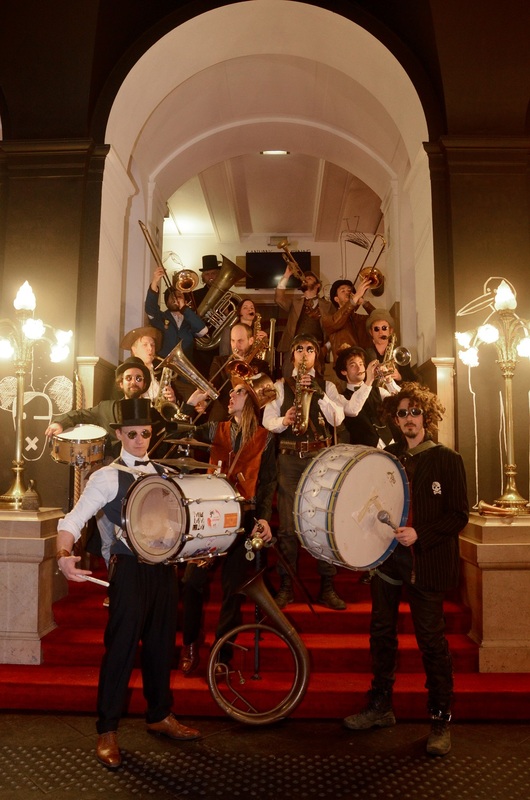 With this album the band wants to show their versatility while retaining their signature sound, urging the orchestra to more unconventional noises. 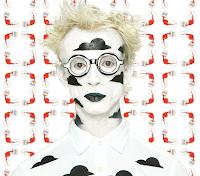 In a tongue-in-cheek way, they mash up traditions with more modern influences, electronic and other. 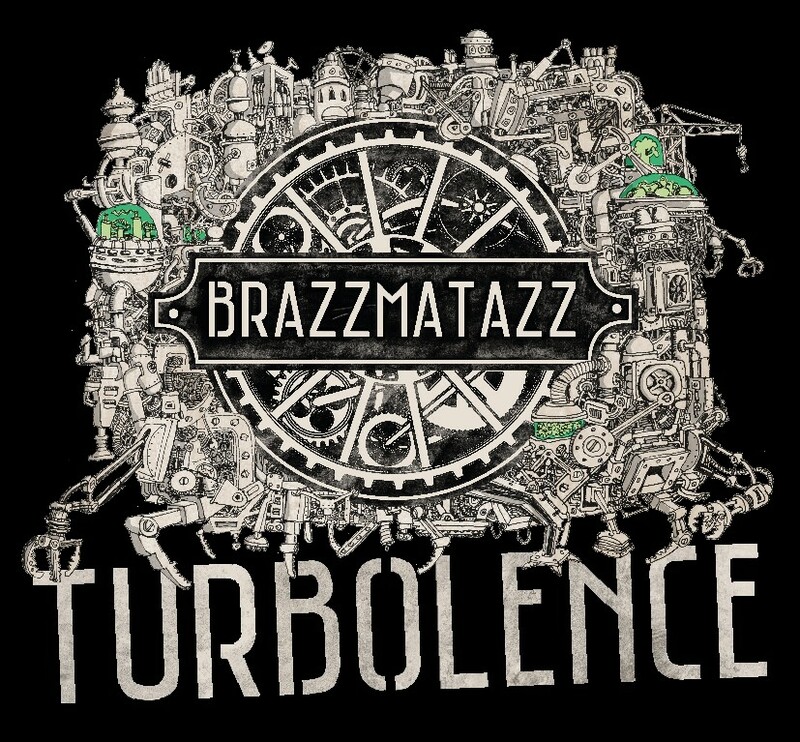 These previous years Brazzmatazz had the honour of playing Belgium's finest stages in the club- and festival circuit, gaining them a reputation as an ecclectic and thrilling live band . In 2016 their hometown of Ghent awarded them as “Best Street Act” in the renowned Ghent Festival. 2018 also brings them a new and improved show, with brand new costumes and stage props in their characteristic steampunk style. This CD will be released February 23rd at club Charlatan, Ghent, more information can be found through our website or social media profiles. "Chains Of Stories" is out and is already getting love from critics and music lovers. I am excited to play some shows in Israel in March and In NY in April. Welcome to Rabbitnews' first edition. We've signed you up for this newsletter because you previously subscribed to an artist who is on Rabbit Rabbit Rabbit Records. This newsletter will be sent out once a month to keep you up to date on all things Rabbit. This will provide you with the opportunity to know what your favorite artists are up to as well as any exciting label news we have to share. We're so looking forward to connecting with you all! Please make sure you're following us on Facebook & Instagram to learn more about album releases, shows and more. We have a new website! Click the image below to meet the Rabbit crew and get access to our ENTIRE catalog. 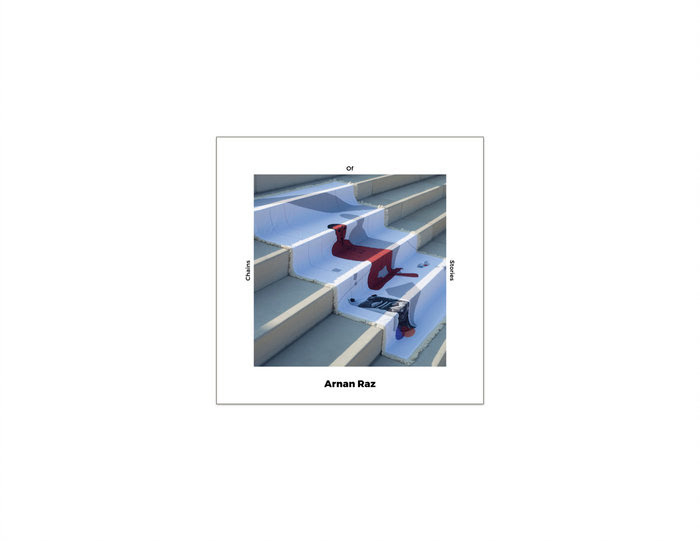 February will be a huge month for us at Rabbit Rabbit Rabbit, with artists Arnan Raz and Daniel Meron both releasing their sophomore albums. 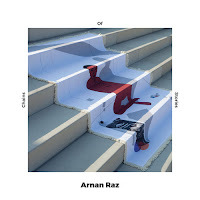 Arnan's Chains of Stories drops February 2nd (2/2) and will feature tunes including 'Two Words One Soul' and a cover of Shalom Chanoch's 'Ella'. 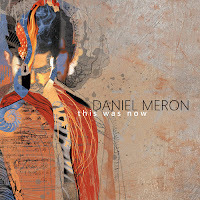 Daniel Meron's solo album This Was Now dropping February 28th (2/28), is all about being in the moment, quieting your inner critic and allowing true inspiration to lead. The album is also available for pre-order on Bandcamp, and iTunes. Click the images below to learn more about the upcoming releases. 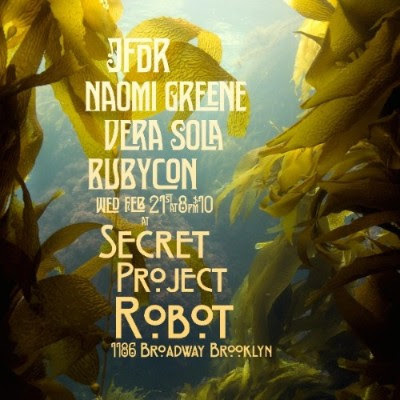 Last November, Rubycon debuted the video for their single 'Buku Love'. The mesmerizing video was exclusively featured on Atwood Magazine's site, calling it “a perfect introduction to the band’s juxtaposition of fun frivolity and deeper meaning.” Keep up with the band on Spotify and Apple Music. 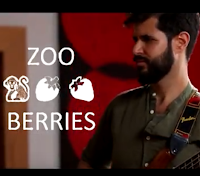 Zoo Berries' (Ayal Tsubery) video for 'Back in Time' came out earlier this month. This is the first out of four videos from their upcoming EP, featuring Nadav Peled on guitar, Peter Kronrief on the drums, Hailey Nisewanger on saxophone and Daniel Meron on the piano. Click the images below to see both videos. 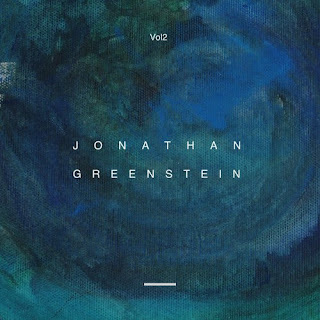 Jonathan Greenstein's Vol. 2 released in November of last year featuring the single 'Once You're There'. Within its first week, the single was among a number of hand-picked songs highlighted on Spotify's official State of Jazz playlist last December and now has over 170,000 streams. Click below to listen to the full album and more on Spotify. at Secret Project Robot in Brooklyn, NY. 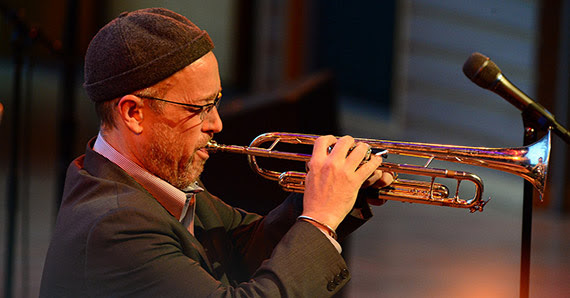 Dave Douglas’s newest project, Dizzy Atmosphere, celebrates a giant of music and one of America’s warmest, wittiest, wildest trumpeters and composers; Dizzy Gillespie. 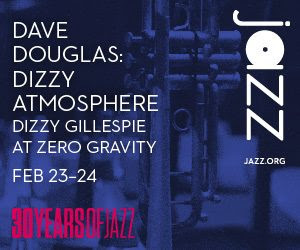 Dave invited a stellar cast to explore this music in new ways: subtitled Dizzy at Zero Gravity, the band will explore Gillespie’s music through new improvisations and interplay. Don’t miss out on the opportunity to hear this all star ensemble revisit Gillespie's works and debut new Douglas originals written especially for this concert. We’re offering special discount tickets to the Greenleaf community! Save 25% on tickets for the 9:30PM sets when you use the discount code “JazzFan25” when you purchase your tickets online, at the box office or through CenterCharge. DOLORES SCOZZESI’s voice is an anodyne for the cookie cutter vocals of so many singers we hear today. 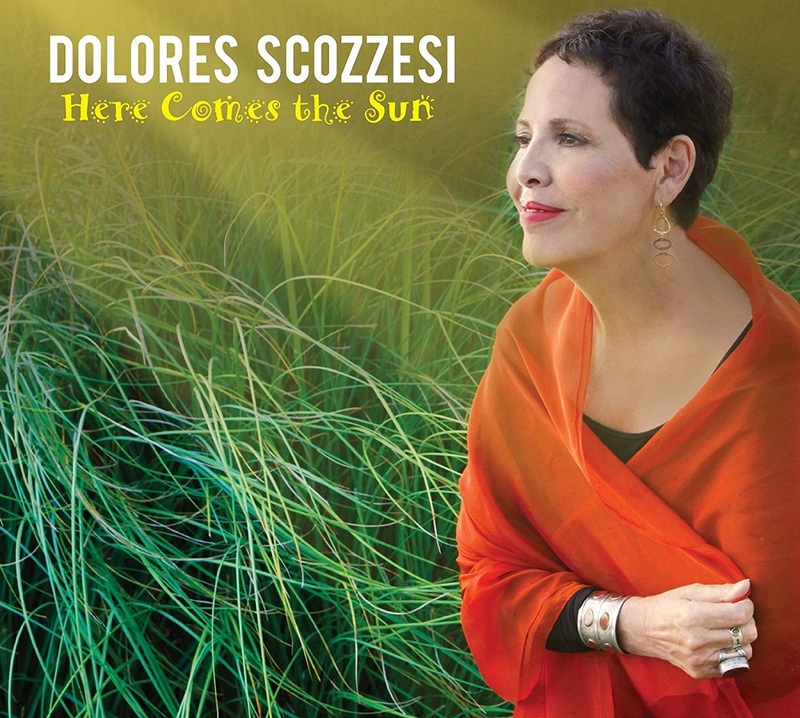 HERE COMES THE SUN, her newest CD, features Scozzesi’s unique sound and an engaging mix of tunes ranging from jazz and pop standards to off-beat and rarely done compositions. It follows up her 2010 release, A Special Taste, which received excellent reviews. Scozzesi, a New York City transplant, has been performing in Los Angeles clubs for many years. 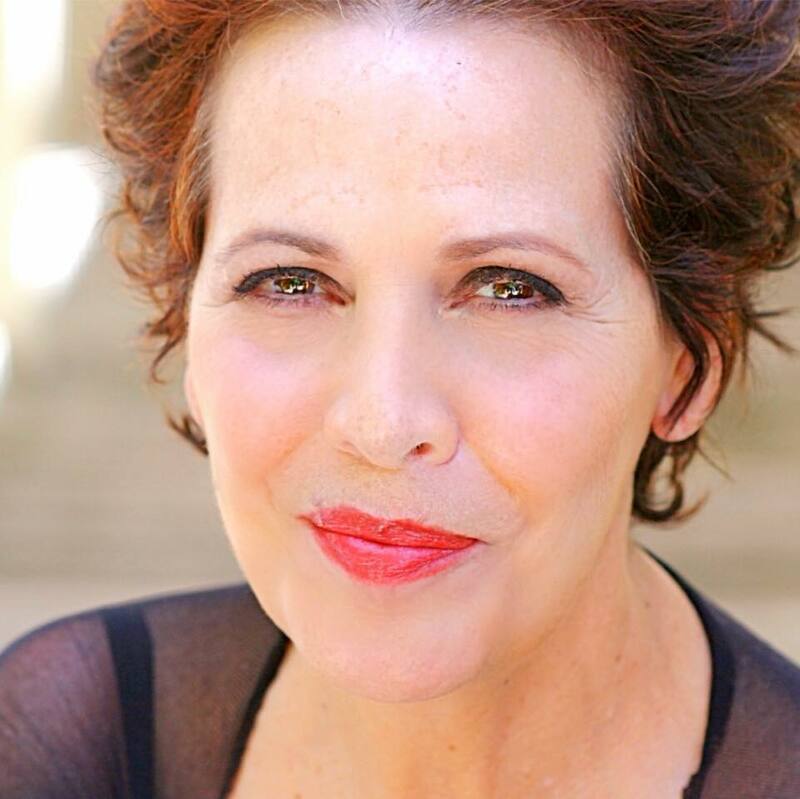 She began her professional singing career at Budd Friedman’s Improvisation Comedy Club, singing between comedy acts of up-and-coming talent, many of whom, like Robin Williams, Larry David and Jay Leno, have gone on to become household names. She began developing her singular style by singing in jazz and cabaret rooms around Los Angeles. Scozzesi also had the opportunity to perform in France, where she sang traditional American blues and jazz in Lyon and Paris. Over the years, she’s built a fan base and a solid reputation as a singer who can captivate an audience with her sultry voice, charismatic personality, and forthright honesty. Scozzesi opens the CD with a crisply enunciated rendition of Cole Porter’s “It’s Alright with Me,” arranged by RICH EAMES and Scozzesi. Eames, the versatile pianist, composer and arranger, also wrote the arrangement for George Harrison’s “Here Comes the Sun,” which features the stellar guitarist LARRY KOONSE. Scozzesi takes a very different approach on this tune from Harrison’s original version. She sings with an earnestness that acknowledges the darkness and difficulties of the past that give urgency and much needed hope for a better, sunnier future. QUINN JOHNSON and DORI AMARILIO also wrote arrangements for this project. Johnson, the longtime musical director for Steve Tyrell, wrote a funky arrangement for Randy Newman’s “You Can Leave Your Hat On,” as well as arrangements for the jazz standards “Wild is the Wind” and a very moody version of “In My Solitude.” As Scozzesi relates, “I want to know who an artist is, and I’m attracted to artists who reveal themselves on stage. I always try to get to the truth of who I am when I perform, and I’m entranced by singers who are totally authentic.” Indeed, Scozzesi sings “In My Solitude” with a somber sensitivity that cuts right to the heart of the lyric. Amarilio is a busy guitarist with a long resume of film, television, and gaming credits. His version of “I’m in the Mood for Love” opens with Scozzesi singing with only the accompaniment of LYMAN MEDEIROS, a first call bassist in L.A., and features a melodica solo by ANDY LANGHAM, who has performed with a virtual Who’s Who of top jazz artists including Poncho Sanchez, Christian McBride, and Jane Monheit. Amarilio also wrote arrangements for Dave Frishberg’s “A Little Taste,” “Harlem Nocturne,” and a quirky version of “Tequila,” with new lyrics by Amarilio and MARK WINKLER, who produced this CD. Scozzesi is also joined by NOLAN SHAHEED on trumpet and KEVIN WINARD on drums. Both are top-notch studio musicians with extensive resumes that include some of the most well-known names in the music industry. With Scozzesi’s rich and edgy voice, emotive interpretations, and wide-ranging choice of material, HERE COMES THE SUN is an enticing tour de force by an artist who defies easy categorization. 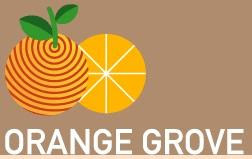 Four Orange Grove Artists nominated for JUNO Awards! The JUNO Awards will be held on Saturday, March 24th and Sunday, March 25th in Vancouver, Canada. Congratulations to Ernesto, William, Tara, Andrew, and Mike! Please let us know if you're interested in setting up an interview with any of these artists. Ernesto Cervini’s Turboprop burst on to the North American jazz scene in 2015 with the release of their eponymous debut. With Rev, Cervini continues to prove that he is one of the most talented drummer/composer/bandleader’s in the jazz scene today, and Turboprop is one of the most joyous and creative outlets. As Cervini states, “although I am the band-leader, Turboprop truly feels like a collective due to the passion, commitment and love everybody brings to each performance.” This passion and commitment is front and centre on Rev as each member of the band is given an opportunity to shine, all delivering poignant and memorable musical moments. The album features a well-crafted balance of the subtle and the bombastic, the subdued and the raucous. Featuring five original pieces (including 2 from Cervini), two pop covers, and one jazz standard, there is plenty of variety for all to enjoy. Turboprop features. Joel Frahm, Tara Davidson, William Carn, Adrean Farrugia, Dan Loomis. Following up on their Juno-nominated debut, Murphy is the exciting new recording from the Toronto-based nonet, the Carn Davidson 9. This electrifying new release exemplifies the musical growth of the group. From the ensemble playing, to the solos, to the repertoire, Murphy epitomizes the sound of the band. Featuring 8 new compositions by co-leaders William Carn and Tara Davidson, this new recording also features new arrangements by not only Carn and Davidson, but also by Geoff Young, Andrew Downing, Jason Logue, Ernesto Cervini, and Andy Ballantyne. All these musical perspectives blend to form the unique and beautiful sound of the Carn Davidson 9. The Carn Davidson 9 was formed at the beginning of 2010. This collaborative project is an opportunity for both artists to “reimagine” their compositions for this chamber jazz instrumentation, shining new perspective on their existing repertoire. Named after the sleepy town in Tobacco Country where Downings roamed throughout the 20th century, OTTERVILLE is a new sextet led by Andrew Downing that evokes the peace, quiet and simplicity of small-town Ontario. It features Downing on cello, Tara Davidson on alto saxophone, Michael Davidson on vibraphone, Christine Bougie on lap steel, Paul Mathew on bass and Nick Fraser on drums. The subtle, song-like of compositions and the contained virtuosity of the musicians take a sweet and contendedly nostalgic snapshot of the slow passage of time in the country and the joys that it can bring. Rev is the second album from Ernesto Cervini’s Turboprop, and it’s a shoot-the-lights-out blast of a listen… The group has an infectious, propulsive energy that delivers a power punch without forsaking nuance and melody… Here and throughout the entire program there’s a sense of closeness and shared spotlight, playing with, around and through, but never over, each other… Overall, Rev is a bright wave of an album and Turboprop is the real deal. Turboprop will be on the road in 2018. I, for one, would love to see this band live. "Murphy" is a delight from start to finish. Even if you are allergic to cats, this music will make you smile, dance, relax, and, honestly, feel better. Carn Davidson 9 is a true "family" ensemble (listen to "Family Portrait" to hear how all the voices come together to move the narrative forward), one that creates music you'll want to listen to over and over. Andrew Downing’s delightfully woozy, two-disc Otterville conjures a simpler, more communal and friendlier time. It’s a largely medium tempo affair, melodic and, like its gorgeous graphic design, subtly wondrous… ingenious chamber jazz… More dreamy than nostalgic, Otterville evokes a country getaway, a place you may not know but where you’re always welcome. The door to this unusual Canadian jazz reverie is open. Make yourself at home. "James Hall and his band [have] an eclectic, but inviting, voice. Their music is accessible, but weaves in and out of some of the highest realms of Jazz and Classical tradition." 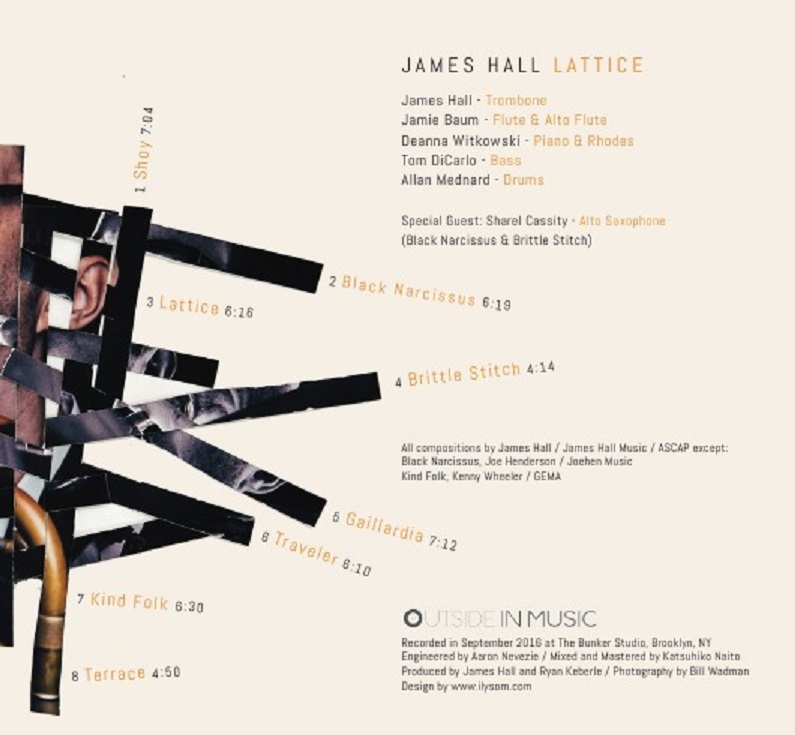 Intricately weaving together voices, melodies, ideas and genres, Lattice is the alluring and inventive sophomore release from trombonist/composer James Hall. Due out February 9, 2018 from Outside In Music, the album is built around the harmonious combination of Hall's dexterous trombone and the virtuosic flute playing of Jamie Baum, a study in contrasts that proves remarkably pliable and expressive through Hall's inspired vision. 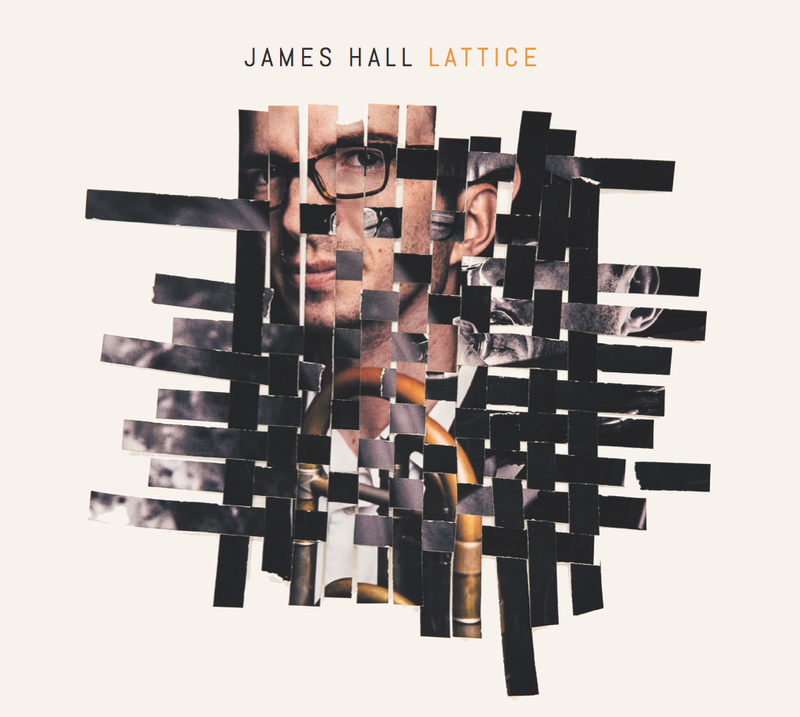 Lattice follows Hall's acclaimed debut, Soon We Will Not Be Here, in which he and his Thousand Rooms Quartet set the work of contemporary New York City-based poets to Third Stream-inspired music that struck a delicate balance between modern jazz and contemporary classical music. Lattice eschews the vocals of its predecessor and veers in a more recognizably jazz direction, though Hall's richly detailed writing maintains the sophisticated architecture of chamber music without forsaking the passion and propulsion of the best modern jazz. To achieve those ends, Hall enlisted a skilled band with an elusive chemistry to breathe life into his compositions. 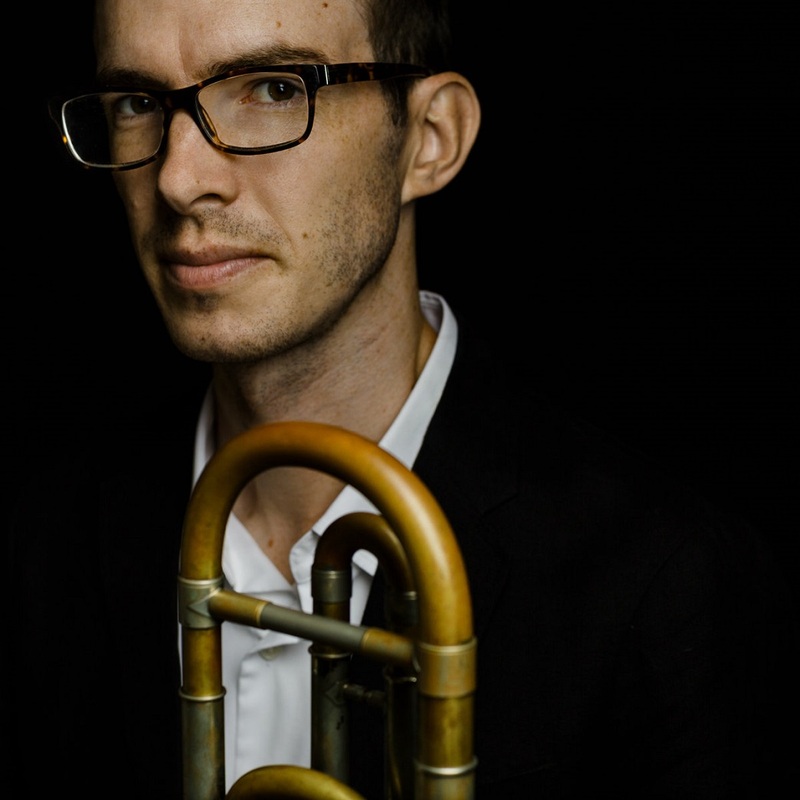 In addition to Baum, he's joined by keyboardist Deanna Witkowski (Donny McCaslin), bassist Tom DiCarlo (Claudio Roditi, Sean Jones), and drummer Allan Mednard (Kurt Rosenwinkel, Aaron Parks). On two tracks the band is supplemented by in-demand saxophonist Sharel Cassity (Herbie Hancock, Wynton Marsalis), whose fiery alto adds a new flavor to the often more contemplative styles of Hall and Baum. A lattice necessarily begins with two pieces crossing, and for Hall that second piece was his now-wife, Kristen, to whom Lattice is dedicated. Their romance, engagement and marriage provided the spark that inspired him to begin writing this music. "I wanted to compose a project for two voices," Hall explains. "The idea of two voices in close counterpoint seemed like a nice parallel to the love story that was happening in my life at the time. It all came together with the interweaving of melody lines reflecting the interweaving of two lives." More direct musical inspiration came from a few sources that Hall had long admired. One was legendary trombonist/composer/arranger Bob Brookmeyer's writing for two voices, exemplified by his work with Stan Getz and Jim Hall. Another was the interplay of bass trombone and flute on Herbie Hancock's classic album Speak Like a Child. Baum shared Hall's love for that album, and their bonding over it was key to her signing on for the project. Two strands are not enough to make a latticework, however, and as a number of pieces intersect to form a pattern, so Hall's project expanded to encompass other voices and inspirations. He crossed paths with Mednard while both were touring with the retro-pop ensemble Postmodern Jukebox, while DiCarlo was suggested by Baum. Witkowski was introduced to Hall at the release concert for Soon We Will Not Be Here, and her interest in his music was matched by her gifts for interpreting it on both piano and Rhodes. The scale of Hall's concerns expanded and intersected as well. While a new love - not to mention wedding planning - can be all consuming, eventually the outside world intrudes. Never has that been more true than in recent years, as a project conceived on an intimate personal scale inevitably took on a broader scope as harsh realities came to light. The injustices brought to light by the Black Lives Matter movement and the divisive aftermath of the 2016 presidential election forced Hall to widen his perspective. Again, Herbie Hancock proved inspirational; Speak Like a Child was released in the politically tumultuous year of 1968, its hopeful call for a more childlike and loving perspective a conscious refutation of the day's clashing ideologies. "It's a pretty album produced at an ugly time," Hall says. "So as the world was sliding into an abyss and I was working on what for me was 'pretty' music, I was thinking of Herbie as a precedent." The lilting melody of "Shoy" opens the album, tipping its hat to another form of interweaving - the hybridization of grapes to create new wine varietals. While living in Germany more than a decade ago, Hall worked on a vineyard that specialized in the Sheurebe grape - the title is a transliterated shortening of the name - which is a cross between Riesling and Silvaner. Cassity's supple alto kicks off Joe Henderson's familiar "Black Narcissus," which floats on Witkowski's airy Rhodes while being driven by Mednard's subtly roiling rhythm. The title track is patient about bringing its divergent voices together, finally melding into a hopefully melodious theme at the song's halfway point. The simmering swing of "Brittle Stitch" muses on the fragility of any relationship and the care and attention they require, while "Gaillardia" does some of that work by hinting at Hall's wife's maiden name in the form of a flower. The elegiac "Traveler" is dedicated to the composer's great-uncle, whose passion for roaming the world and unconventional pairing with Hall's great-aunt both offered models to emulate. "Kind Folk" is one of a few gorgeous Kenny Wheeler tunes that entered Hall's songbook after the late trumpet great served as artist-in-residence during Hall's time at Lawrence University, while the bluesy "Terrace," featuring the full-throated moan of Hall's muted trombone, closes the album with a portrait of his adopted neighborhood in Brooklyn. "A lattice is made up of many intersecting parts," Hall concludes. "As this project matured, even if I composed a piece thinking about myself and my wife, the lattice grew to incorporate everyone I met, everyone I engaged with. It touches on the question of where I sit in the lattice that is New York City, or on a larger scale, that is America in the 21st century. I take heart in the fact that there can be as many strands and intersections in a lattice as there are people or relationships in my life. Maybe it starts with me and my life or my family, but it doesn't have to end there." 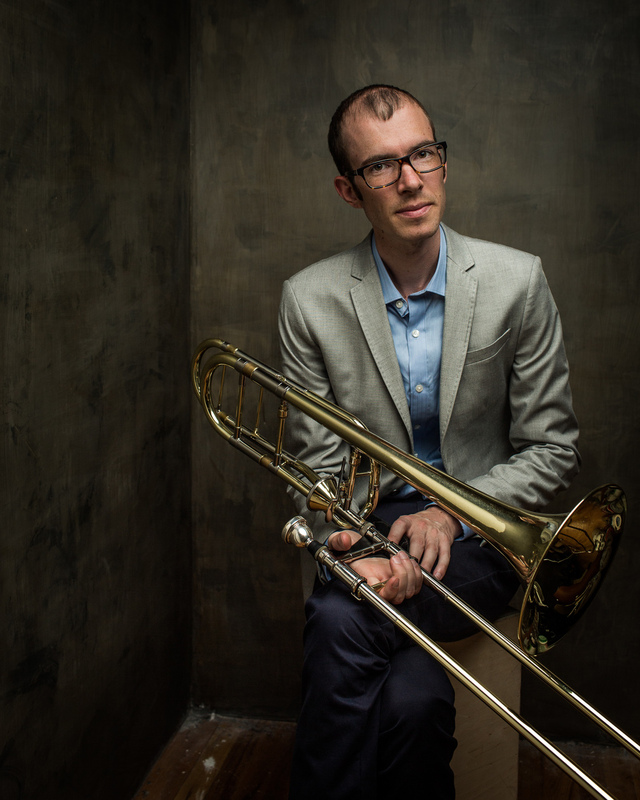 A trombonist and composer from Nebraska based in New York City, James Hall is a versatile musician and composer whose projects have spanned jazz, classical, Latin, and popular music. 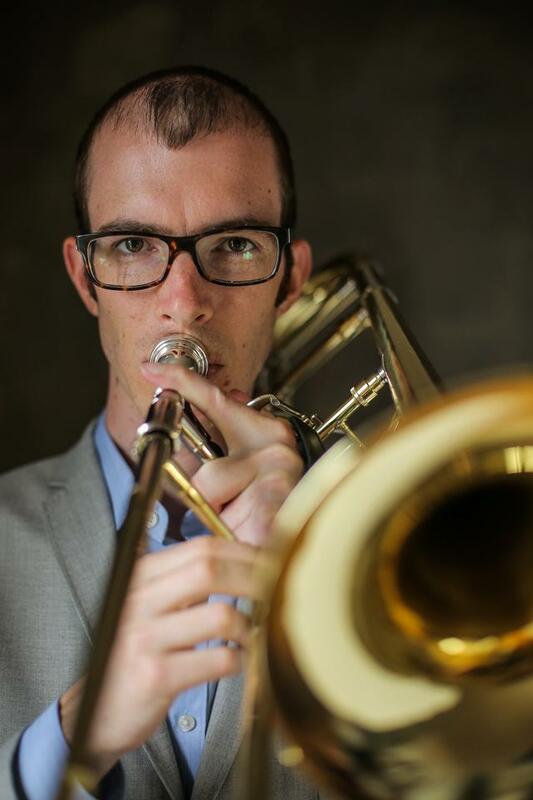 As a composer and bandleader, James was named a finalist in the ASCAP Morton Gould Young Composer Competition, won three ASCAPlus Awards for composition, and was a featured performer/composer at the 2012 Chelsea Music Festival. 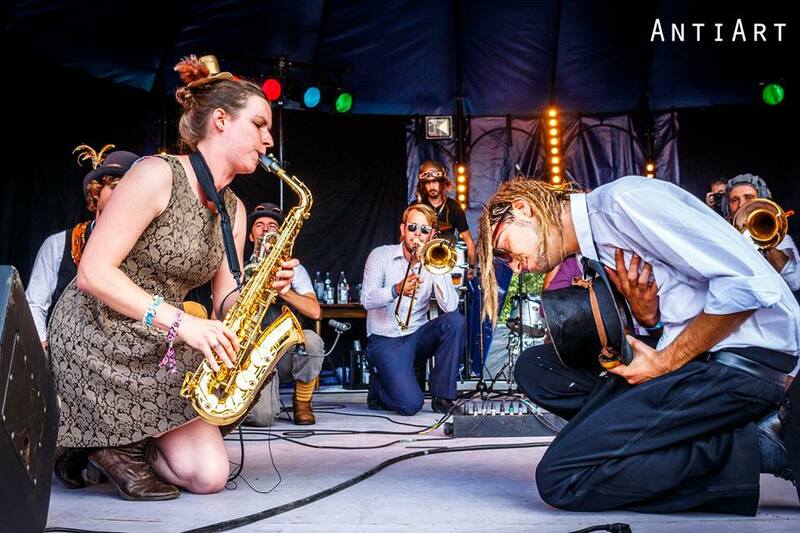 He has appeared on several recordings with Postmodern Jukebox, with whom he has toured Europe and the United States. His first CD as a composer/bandleader, Soon We Will Not Be Here, was released in October 2013 and featured his Thousand Rooms Quartet. James holds degrees from the Lawrence Conservatory of Music in Wisconsin and Aaron Copland School of Music in New York. His teachers have included Luis Bonilla, Hal Crook, Michael Dease, Nick Keelan, Ed Neumeister, and Fred Sturm.